My father was a DC 3 pilot way back in Cuba. 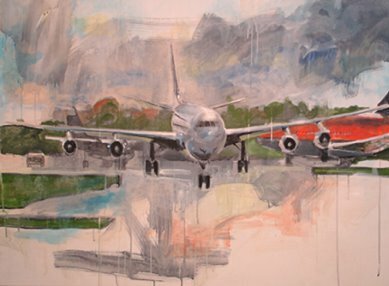 Its part of me, I check out airplanes the same way I check out hot art chicks at gallery openings. This work is a sort of a break out piece. I thought of doing it as I drove back to my studio and I wouldn't let any distraction until I got it to where I wanted it.